I really enjoyed this movie, but I'm not sure that the portrayal of the NTSB investigators was fair or accurate. Professional flight investigators should know how to include time for information collection and decision making in their simulations, shouldn't they? I saw this movie with my brother, who is an airline pilot. He said he felt the cockpit scenes were quite accurate. This is really a movie about September 11th. Airplane disaster, new York, buildings, post-traumatic stress, harrowing rescue by first responders. This story has a happy ending, and I think we need it. This film verges on libel. I think that antagonistic investigators storyline lessened the effectiveness of the film. It was dumb and implausible. I just really enjoy watching people being competent and good at their jobs. Why does this story even need a villain? Isn't a potential catastrophe averted through skill, cooperation and calm good judgement enough drama? Every movie needs a villain. The portrayal wasn't accurate. However, that portrayal IS used as a tool to illustrate the constant scrutiny of professional pilots. That aspect is accurate. C'mon, really? Apollo 13 doesn't have a "villain" and it's one of the best examples of this kind of film. “Until I read the script, I didn’t know the investigative board was trying to paint the picture that he had done the wrong thing. They were kind of railroading him,” says Eastwood in one promotional trailer. It’s not surprising Eastwood was ignorant of any railroading by the National Transportation Safety Board (NTSB), since it’s a narrative absent from Highest Duty, or anything actually said or written by the NTSB. does Sully’s portrayal of NTSB investigators as bullying incompetents matter?... In evaluating such... what’s important is whether or not the top-line takeaway is fair. ... the takeaway is that the NTSB – as I heard one person leaving a screening say – “tried to stitch Sully up”. Around the world, the NTSB’s investigations are regarded as setting the gold standard for impartiality, perceptiveness and making recommendations with important safety benefits. The NTSB has saved countless lives. Yet the NTSB has no regulatory ability: to turn its recommendations into practice, the board relies solely on a moral authority founded on its reputation for diligence. The stakes are high – the board currently has a list of 10 critical safety improvements that it’s trying to get implemented, including, for example, positive train control, something that would have spared 243 people last year from a deadly Amtrak derailment. Sully ... will create a headwind in the minds of the public and policymakers that the NTSB will be struggling against for years to come. The respect that was shown to Sullenberger after the crash landing was certainly well-deserved, but also had a whiff of blind patriotism. It was such a cheap and easy twist to turn the story into a hero versus gubmint crusaders, and I knew that was exactly what would happen when I saw it was an Eastwood joint. He’s good about poisoning discussion (American Sniper is a savagely partisan movie that everyone should be ashamed of). Can’t wait to see what empty chair Eastwood rants at next! Every movie needs an antagonist, traditionally -- something the hero must confront and overcome. It need not be human, even. It could be something like Canadian geese disabling the engines of an aircraft and forcing an emergency water landing in the Hudson, and the pilot dealing with PTSD afterward. I mean, that's man vs. nature and man vs. himself right there. It was such a cheap and easy twist to turn the story into a hero versus gubmint crusaders, and I knew that was exactly what would happen when I saw it was an Eastwood joint. That's a really unfair and prejudiced judgment. In light of the article linked above, and the quote pulled by amtho, Eastwood was not responsible for the NTSB antagonism and wasn't aware of it until already attached to the movie. Because it didn't exist, not in this form. It was a fictional element added to the script. Why not ? It certainly wasn't in the book the film is based on. He's the director, isn't he ultimately responsible for the movie ? An empty chair, as it were. Just so the record is clear about the screenplay's need to turn the NTSB into the villains, the site History vs. Hollywood reports, "The real Sully insisted the names [of the NTSB investigators] be changed for the film since the movie treats the NTSB investigators as the 'villains' of the story, painting them to be more vindictive and out-to-get-'em than they were in real life." His own account of dealing with the NTSB's findings is, of course, much more nuanced and technical. The geese are the villains, obviously. Perhaps a few scenes of them plotting to rain fire from the skies on the humans would have helped. Followed by gleeful cackling. Lots of cackling. I think The Onion gets it right this time. I saw it, and I saw it on the anniversary of September 11 and it was emotional. But the first thing I did when I got home was to google more about the NTSB angle as I hadn't heard anything at the time of the accident. Not surprisingly, they were not trying to pin anything on the pilot. Doesn't everybody go home and google stuff like this after seeing a movie "based on real events"? Yeah, it's a well-made movie, and Tom Hanks is fantastic as usual, but boy did they pad it out with fake controversy and antagonism from the NTSB. Then again, it's barely an hour and a half long: if they hadn't added all that faked controversy and had gone with the straight truth, it'd probably only be about 30 minutes. Eastwood's ultra-conservative bias is definitely showing, and I'm sorta surprised ultra-liberal Hanks agreed to do this script. if they hadn't added all that faked controversy and had gone with the straight truth, it'd probably only be about 30 minutes. There are lots of ways to enrich a movie like that: backstories of passengers to raise the stakes, for one. Stories of Sully's past experiences and training that prepared him. Other events in his life that show similar problem solving. Backstories of some of other passengers. They should have padded it with a fakeout. Start the movie with an uneventful flight or two. Don't hit 'em with the bird until the audience has been lulled into complacency. This was a good film--as long as it stuck with the various reconstructions of the crash, Sullenberger's PTSD, and his ambivalence about the hero-worshipping. The ginned-up NTSB drama, though, was just cringe-inducing, and not always well-acted (although Jamey Sheridan managed to restrain most of the figurative mustache-twirling, at least). Structurally, it reminded me very much of the Denzel Washington vehicle Flight, with a miracle-working pilot faces off against bureaucrats representing a robotic regulatory agency; even though Washington's pilot really is a dangerous drunk, the bureaucrats still can't successfully complete the investigation until the pilot decides, at the last minute, that he can't bear to lie. 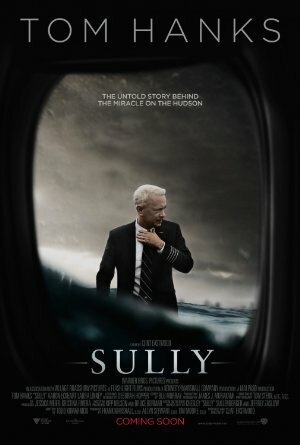 Sully's claim in his film that "humanity" is absent from the investigation was also the case in Flight. And one of my colleagues just posted this link, which also notes the Flight connection (among other things). One of the things this movie did really, really well was to demonstrate how within certain professions, you are held accountable for possible mistakes. We went to see it last night, on the heels of yet two more shootings by the police, and it put the movie into a completely different context. The air traffic controller is immediately pulled from his job the minute it becomes clear that a plane crashed on his watch. Sully and Skiles go before the NTSB the day after the crash. They did the right thing and saved lives and they still have to account for their actions. Not in some kangaroo court that's going to rubber stamp everything they say as the gospel, but as humans who are trained professionals. Even the movie's erroneous assumption that the NTSB was out to get the pilot's hinge on the crucial idea that people make mistakes. Not the equipment, not the birds, but the actual men flying the plane might have made the wrong decision. That despite your decades of training, you could, feasibly make a mistake. Because humans are deeply fallible. Contrast that to the narrative about police who are (at least it feels like it) never held accountable for the human element of their actions and this movie said something to me that I'm pretty sure Mr. Eastwood did not intend. Everything I've heard about this, and everything I've come to know about Eastwood, suggests that it is plain vanilla far-right feel-good pandering, and for whatever reason, I thought Tom Hanks was better than that. So this is kind of a shame.